The Ontario Institute for Studies in Education of the University of Toronto (OISE/UT) is a teachers' college in Toronto, Ontario. 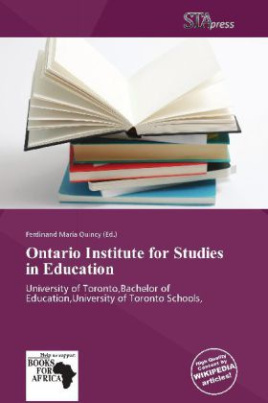 It was founded in 1996 as a merger of the Ontario Institute for Studies in Education and the Faculty of Education in the University of Toronto (which from 1920 to 1972 was known as the Ontario College of Education, U of T). In 1951, the Ontario College of Education offered the first adult education graduate course in Canada. FEUT was the preservice teacher's college offering first professional degrees in teaching. OISE was the graduate and research institution. OISE was a freestanding public degree-granting school before the merger. In 1965, the OISE introduced a masters and doctoral program in adult education. In 1967, OISE introduced the first graduate course in comparative studies in adult education, which was taught by J. R. Kidd. It is located directly above the St. George Subway station.